Read the full success story by clicking on the picture. 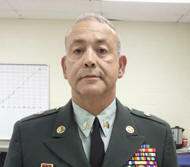 Earl Portnoy, President of Security Reconnaissance Team Incorporated, offered to teach a security class at Redbird Armory. 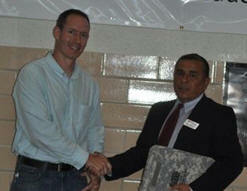 Specialist Gerardo “Jerry” Botello was one of ten JCEP participants that took advantage of the training that week. For Jerry, the class would lead to a Level 3 security guard certification and a new job working for Earl. Mr. Portnoy has hired four JCEP participants, has helped place more than 25 JCEP participants with different companies, and has personally trained over 50 JCEP participants to receive their license in private security. Associate’s degree in Criminal Justice prior to his deployments. SGT Stewart and JCEP started working together in March, first building him a resume he could use when he came home to Iowa after his deployment to Afghanistan followed by an assignment to the Fort Riley WTU. 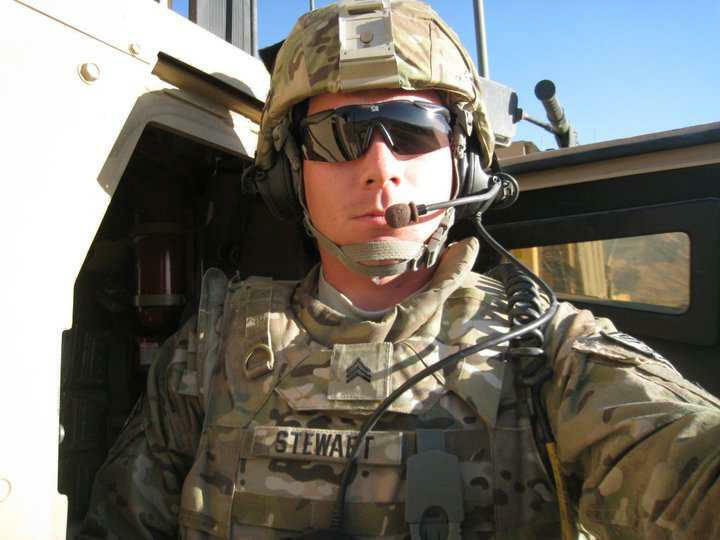 After seven months Sergeant Justin Stewart was released from the WTU, returned to Iowa, and began his new job. 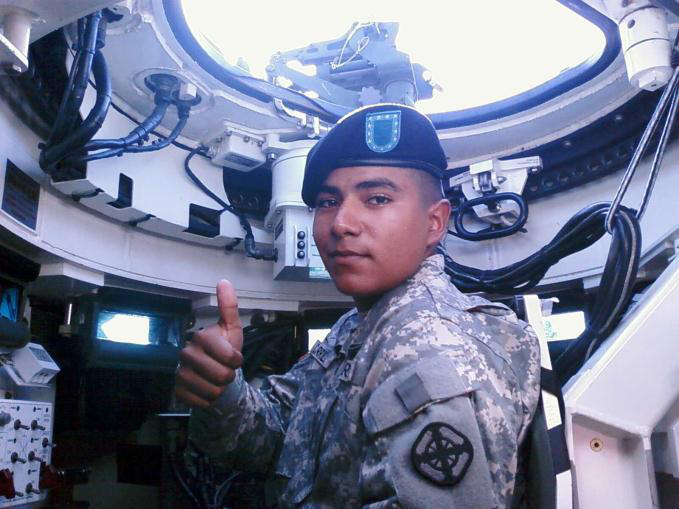 Carlos first heard about JCEP while drilling at Fort McCoy. For Carlos, his dream of becoming a Police Officer was about to come true and according to Carlos, JCEP provided assistance that lead to that success. “One thing that I can say is I am so thankful I signed up for JCEP because it gave me an edge through the job search process. Soldiers need to sign up for the program. 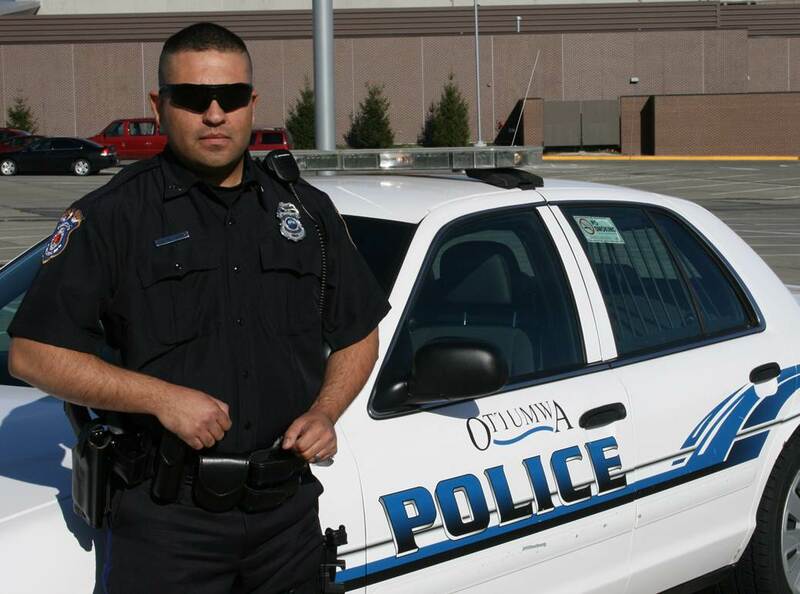 I am so glad as a Veteran we come back to the civilian side and have a program like this.” Congratulations, Officer Carlos Puente Morales of the City of Ottumwa Police Department. 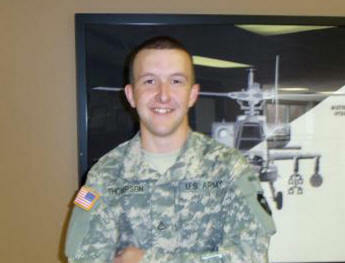 SPC Martin is on his way to bright new career with Schlumberger as a Field Specialist specializing in wire lining. The road to get to where this Texas Army National Guardsman ultimately met his destination was paved with numerous challenges, but SPC Martin met each with determination. 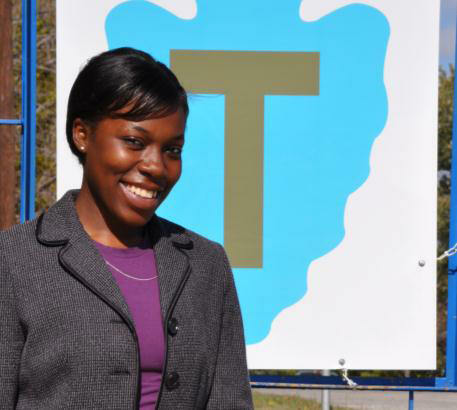 "JCEP notified me of the opportunity, assisted me in targeting my attributes, made the employer connection, and helped with the applicant process so that I could be where I am today." The first time PFC Charity Spead walked through JCEP’s door, she had lost hope, lost confidence, and lost dreams of a better tomorrow for herself and her son. 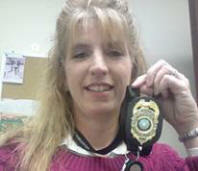 The first person Charity met was Annette Robinson, a Training and Development Specialist with JCEP. After visiting with Charity, Annette learned that she had no resume, no interviewing clothes, difficulties with transportation, and she was living with her mom. This was a lady who needed what JCEP had to offer. After working with JCEP, Charity is employed and living in her own apartment. 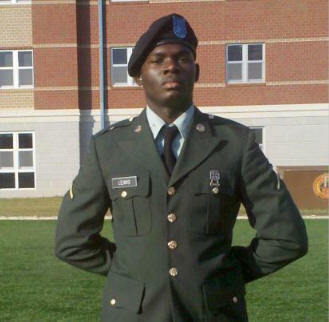 SPC Ryan Adams, a twenty-three year old Texas Army National Guard Soldier, was running out of options and hope of employment, until meeting with Mary Weaver, a Training and Development Specialist from the Job Connection Education Program (JCEP). 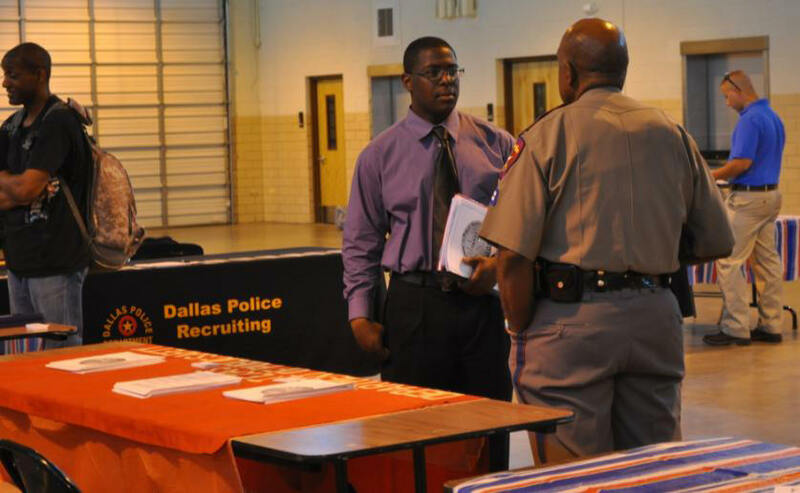 On May 11, 2010, while attending a JCEP Orientation, Ryan was quoted in the Fort Worth Star Telegram, “I’m just grasping for programs like this but I’m not sure how promising this is." Two days later he was employed as a Shipping Specialist. 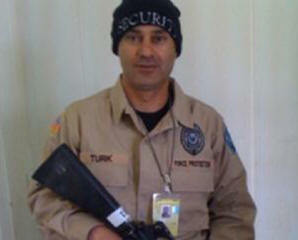 When SGT Michael Turk showed up in the JCEP office he was desperately seeking help in finding employment. 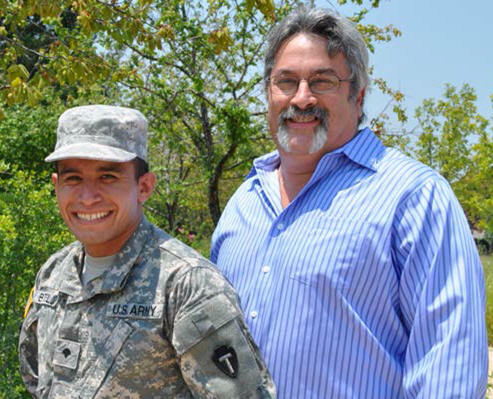 As a Soldier in the National Guard, Michael faced many challenges, but was surprised at how difficult the role of job seeker can be. 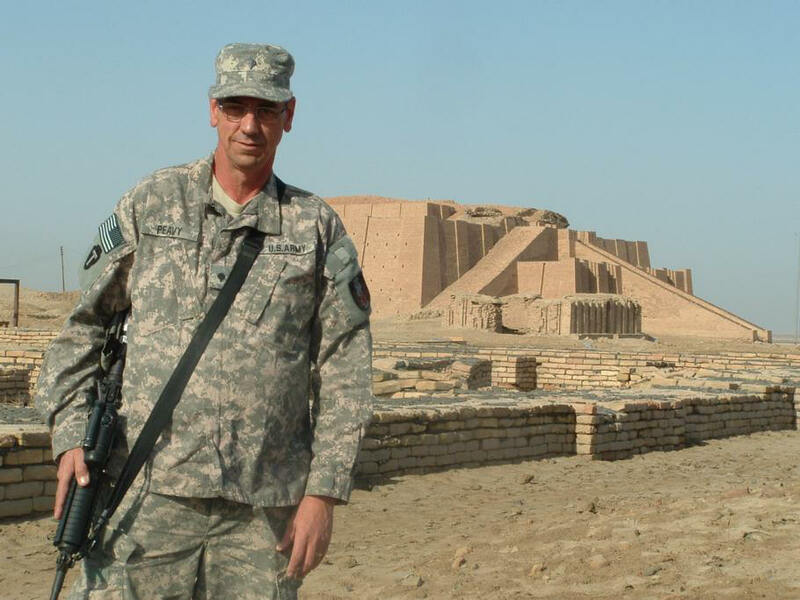 After returning from an Iraq deployment he spent four months searching for meaningful employment without success. “I tried so many ways to get a job and searched locally, statewide, and nationally, but you guys (JCEP) were the best doing what you do,” said Turk. Once the JCEP staff went into action, Michael was on his way to an exciting new job. When asked about her job search SPC Jasmine Wills shared her struggles and frustration at looking for employment. She explained how JCEP was instrumental in the job search, improving her resume and providing encouragement. 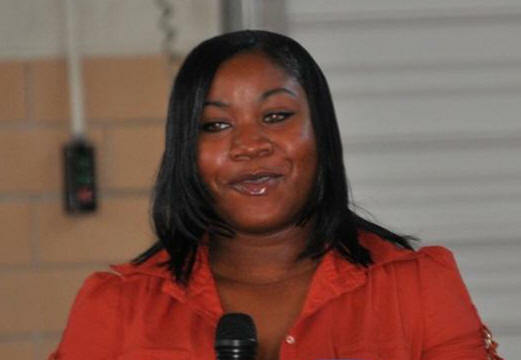 With the support of the JCEP team, she felt she could go after her dream job and was able to obtain employment with the Dallas Sheriff’s Department - and she loves her job. 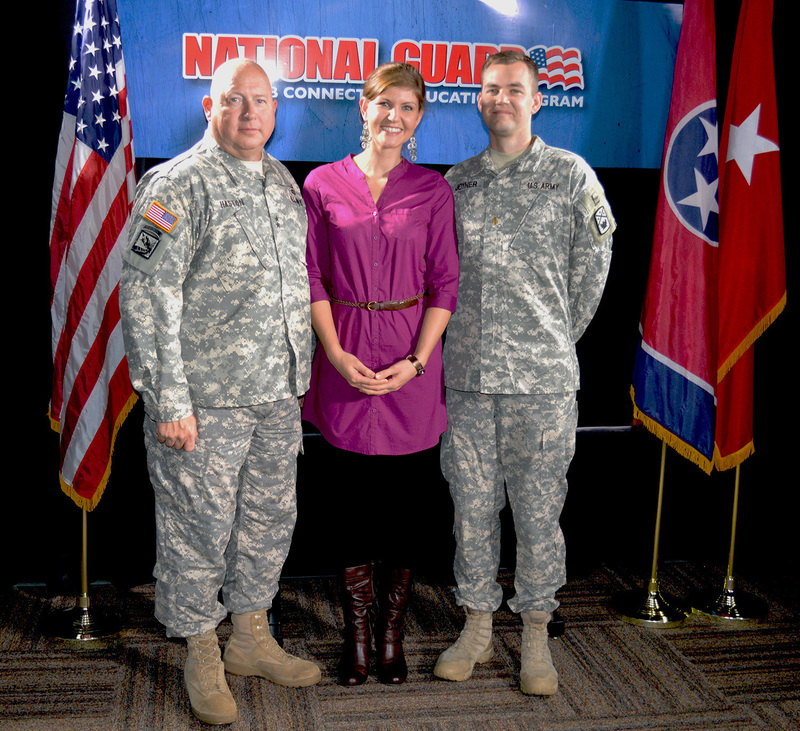 Maj. Gen. Max Haston, the adjutant general of Tennessee, congratulates 2nd Lt. Ian Joyner and his wife Jennifer for being the 1,000th Tennessee National Guard member hired through the Job Connection Education Program. 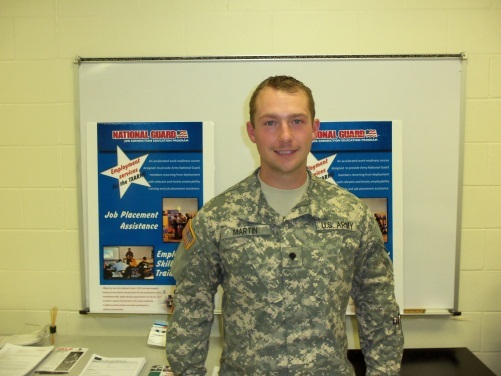 'Job Connection Education Progra m: Building Blocks to Job Search Success' is an article found in the Fall 2012 edition of The Iowa Militiaman - a magazine of the Iowa National Guard. 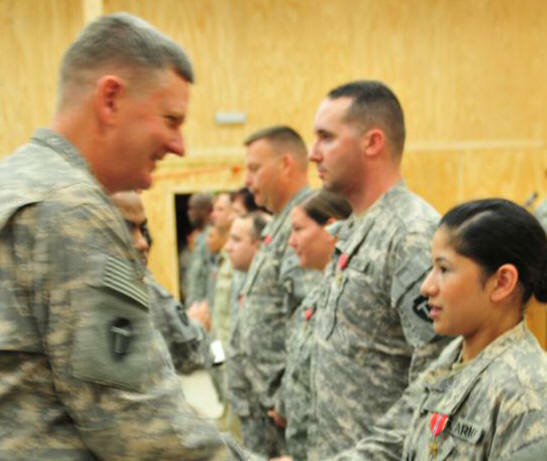 "If our Soldiers have a great civilian career and family life, they will have a great military life." Click on picture for full story. 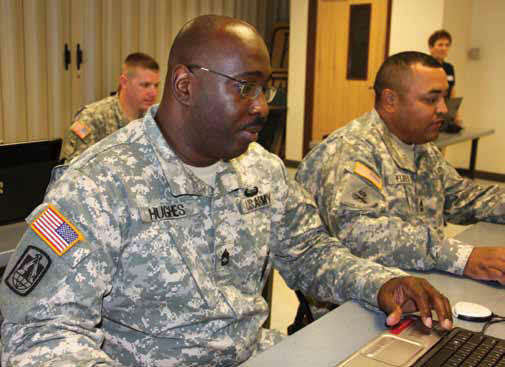 'Job Connection Education Program: Sgt. 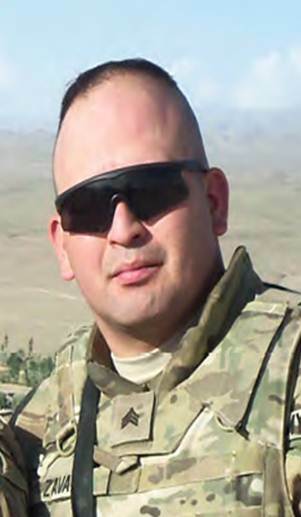 Zavala' found in The Dispatch - Monthly Magazine of the Texas Military Forces. Click on picture for full story. 'Success Through JCEP' is an article that appeared in the GX (Guard Experience) Magazine. A GX journalist visited the Sandage armory to learn more about JCEP. Click here to see the full article. Mark Sier (JCEP Wisconsin, M-day Guardsman, and Medevac Pilot) returned from deployment and started looking for a full time job. Luckily he found JCEP. 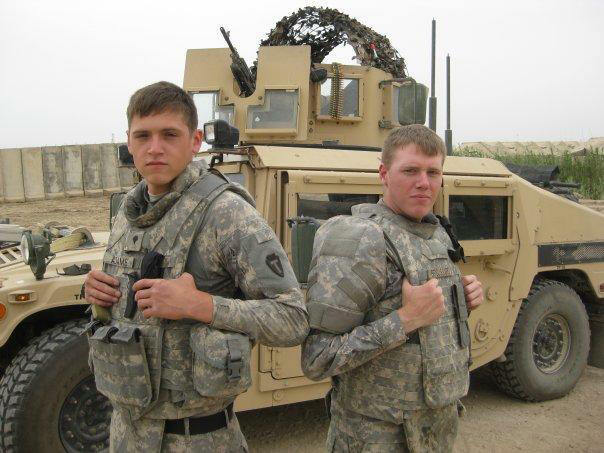 When some of the Soldiers he previously served with were scheduled to return from Kosovo he wanted to help them through the rough job search period he'd previously experienced. 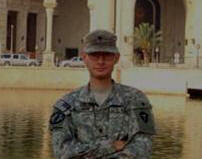 Thanks to his new job with JCEP he and CPT Joe Ledger were able to travel to Kosovo to make that happen. Click on the picture below for the full story. 'How to Apply For Federal Jobs' is one of the more popular workshops offered by JCEP. Click here for the full article. 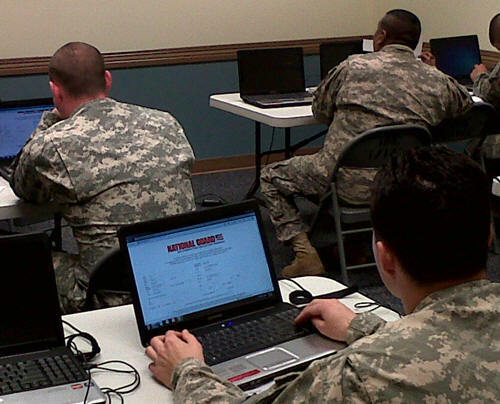 Security Training Classes with Job Fairs have been held at several different armories. Click here to read about one of the first held at Sandage. 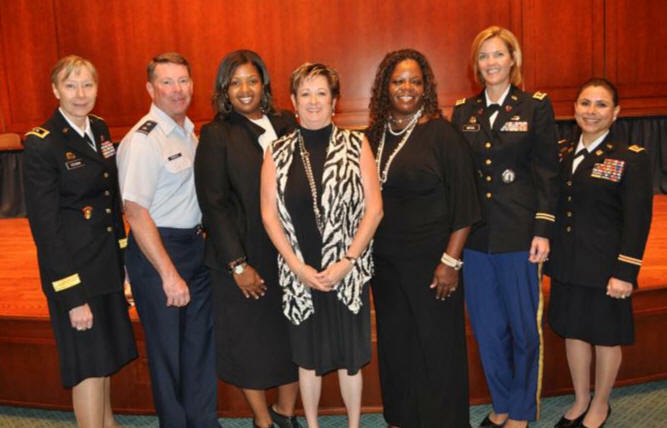 BG Joyce Stevens, Texas Assistant Adjutant General and Commander of the Texas Army National Guard, visited the Houston JCEP office. "JCEP is a wonderful program and we continue to hear great things about it from the field." - BG Stevens. 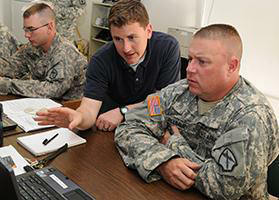 JCEP also provides training and personal resume assistance during drill weekends. 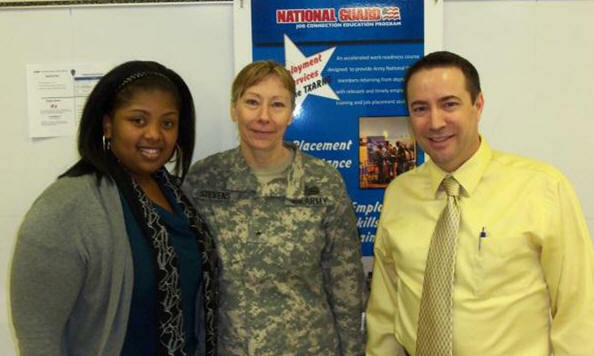 JCEP has partnered with ESGR in Tennessee to provide Employment Assistance Workshops. 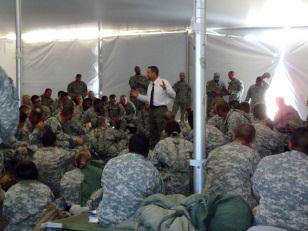 Soldiers from the 230th Sustainment Brigade were bussed 140 miles to attend the event. In August 2012 Texas JCEP celebrated it's 1000th hire at the State Capitol. The JCEP-Houston team deployed to Fort Bliss, Texas to join the 72nd Infantry Brigade Combat Team (IBCT) during their Annual Training (AT) last week. When LTC Barrow, 72nd IBCT Commander, asked the JCEP team to come to Fort Bliss and reach out to his soldiers, JCEP suited up and moved out.